Why Do You Need A Hunting Rangefinder? The main achievements of being a good hunter are to aim and shoot most accurately. If you don’t have these two skills then it can be a bit difficult for you to excel as a hunter. But don’t get discouraged, there is one gadget that can definitely make your life easy and that gadget is the rangefinder. It helps you by providing you with vital information that is the distance between you and the object. When you know the distance then you can shoot your arrow or fire your rifle accordingly. 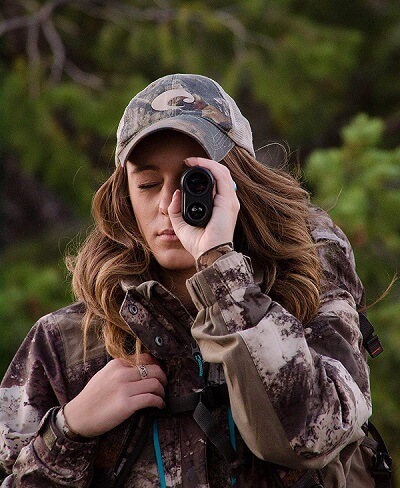 Rangefinders are one of the most important devices that a hunter can have. They are extremely popular these days and have simplified the lives of many hunters. Today, we will talk about the best hunting rangefinder for the money for you guys! There are many brands that have introduced really quality rangefinders. Choosing one can be quite a difficult task and there are many things to consider to get a rangefinder that is perfect for you. 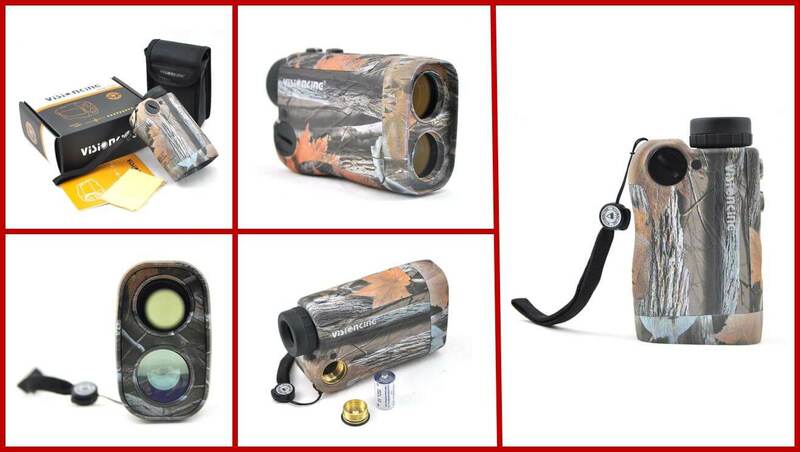 In this article, we’re also going to see different types of hunting rangefinders and the importance of using them while hunting. The Leupold GX-4Ia2 is an excellent rangefinder that has a high-performance DNA (Digitally Enhanced Accuracy) engine to give faster measurements. The rangefinder is highly customizable for every shot and has a waterproof design. It is also very rugged and compact. 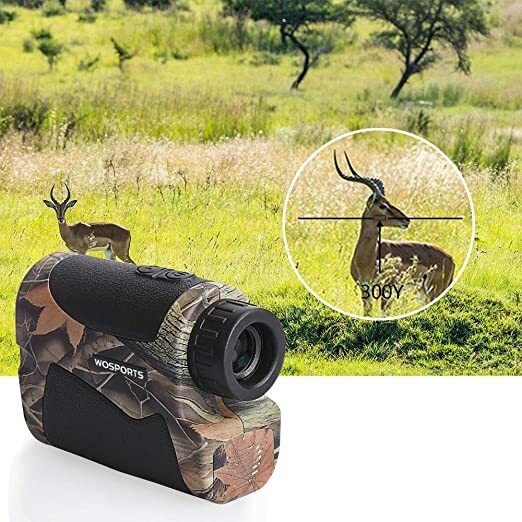 Considering the price tag and the features, this is one of the best all purpose hunting rangefinder for the money and even it can be used in different sporting activities like golf. Well, the Leupold GX-4Ia2 is one of the best rangefinders that you can buy if you have a lot of cash to spend. And we’re talking a lot of cash here. Although expensive, it does have its own share of advantages. From a beautiful design to an OLED display and the DNA engine, the performance and build of this rangefinder is something we should be talking about. On the downside, there can be issues such as blinking while reading the target and sensitivity to certain objects that can manipulate the actual distance. The Sig Sauer KILO2200MR is an American product which has the optical clarity as the main feature. In addition, it is equipped with an OLED display and the new HyperScan Technology is also there. This HyperScan technology gives you 4 updates per second while you are scanning your environment, this can be helpful while hunting when you’re stalking your prey. This rangefinder also falls on the high price bracket. Although nothing is wrong with this bracket, it just doesn’t seem like a buy for most. The quality, however, has no flaws. It’s just the pricing that is too aggressive. The advantages of this rangefinder are many though. First, it has an OLED display with automatic brightness calibration, kind of like the proximity sensor of most smartphones. 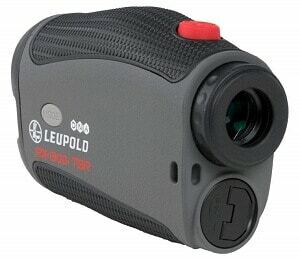 In addition, it provides an accurate display of distance and finally, the rangefinder sports optical clarity. 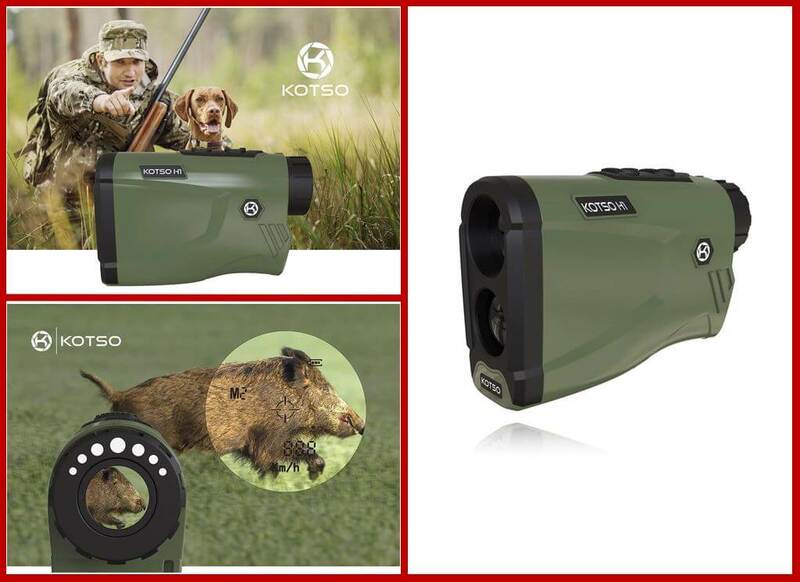 The Visionking 6×25 is a laser rangefinder primarily meant for hunting but it can also be used while you golf. The rangefinder has a lot of features such as water resistance and attached lanyard. The rangefinder can measure about 700 yards with ease and it has a 6x zoom with an objective lens of 25mm. You can’t really expect a good display at this price range. This rangefinder doesn’t even cost 1/5th of the last two rangefinders in our review. Therefore, the cuts on quality and optic are understandable. What we don’t get is the design choice. The rangefinder looks pretty bad, to be honest. It just feels very cheap. Other than that, it is actually a great choice. 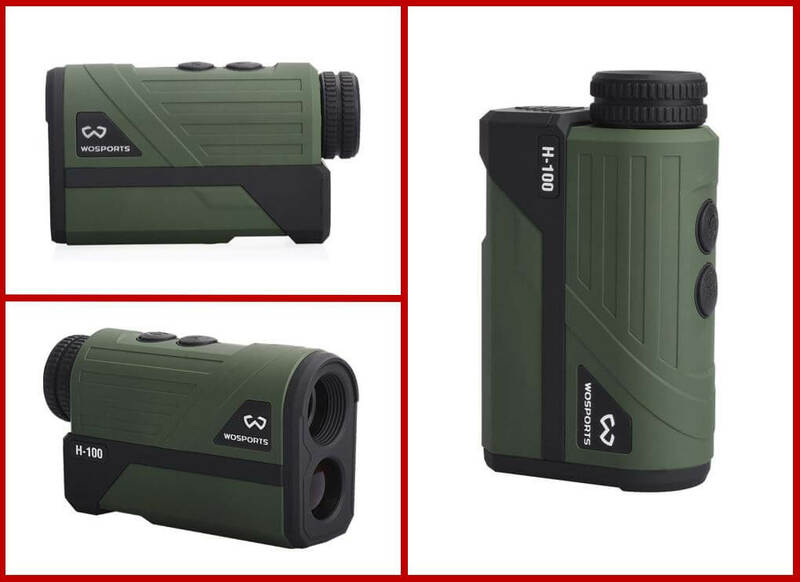 With a water-resistant build as well as being ultra lightweight, the rangefinder also exhibits its affordability with a lot of extra items that come with the purchase. 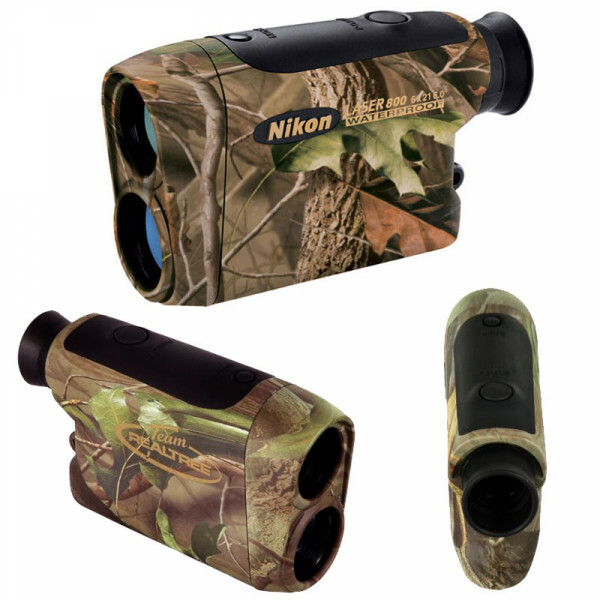 The Team Realtree by Nikon is a laser rangefinder that comes at an acceptable price bracket and has the trust of a popular company like Nikon. 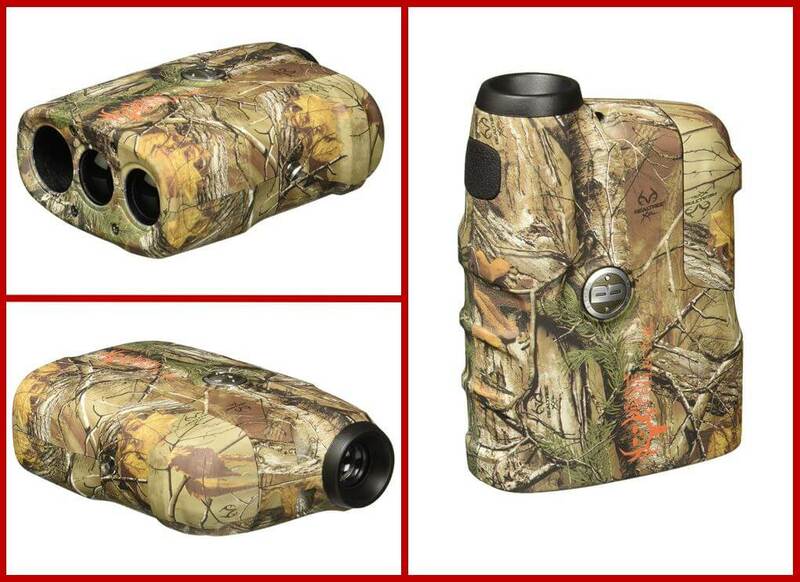 The Realtree rangefinder has a lot of features including the new Tru-Target Technology and fast distance measurement. It also sports a long eye relief that minimizes the strain to the eyes. The build quality of the Nikon Realtree is disappointing. Aside from the build, the rangefinder has plenty of features that make it an instant purchase. The rangefinder comes with an impressive coverage of distance and doesn’t strain your eyes which is always a plus point. The distance coverage of the Perception 1000 by Upland Optics is 1000 yards. The rangefinder comes with a 6x zoom and has a 17mm objective lens. 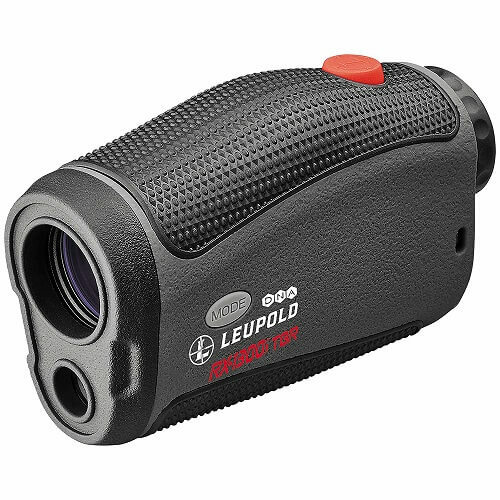 The rangefinder is accurate to within a yard and has a second priority reading mode which is meant for any kind of environment. 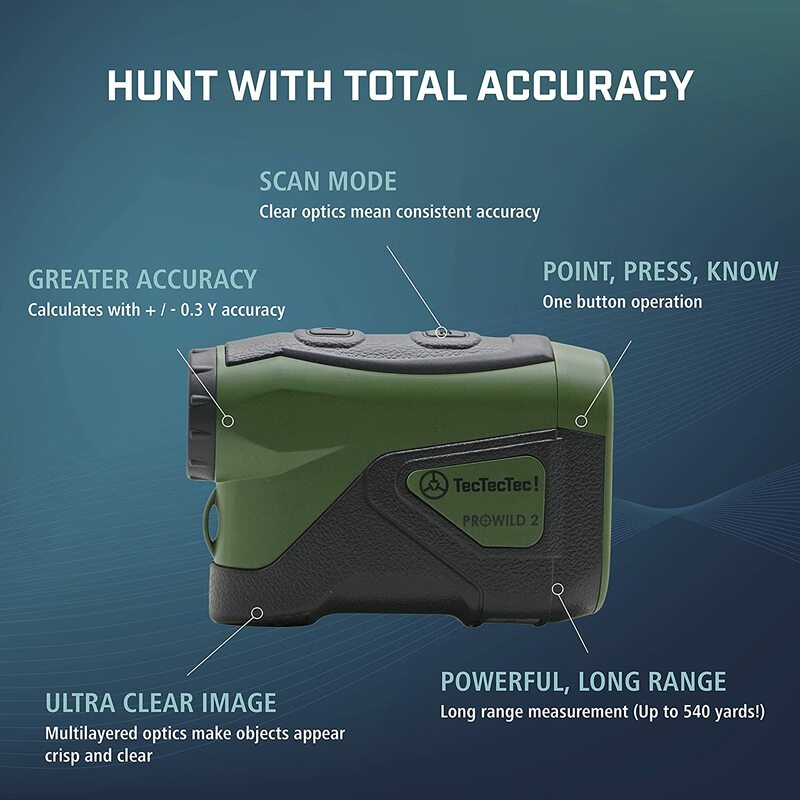 The perception 1000 rangefinder can be of great help while hunting. It provides you with a weatherproof display and performance to match it. There is an adjustable lens according to your monitoring needs. The users can also fit the cameras at different locations and it is pretty simple to adjust. This makes up for a really functional product. The downside here is minor and it is mainly based around the display. Although the display is sturdy and can handle any weather, the quality itself isn’t something to talk about. It’s not OLED, therefore, the display doesn’t have much clarity. 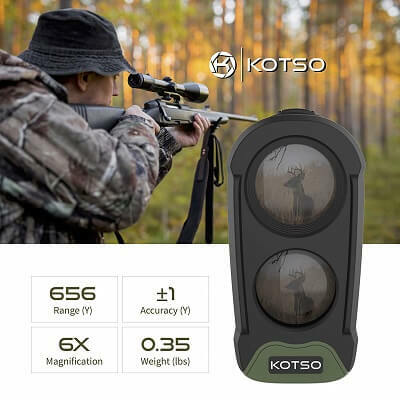 The KOTSO Hunting Arc Rangefinder is perfect for hunting. With 6x magnification and a high-quality lens, the Hunting Arc’s display stacks up to the best. It also comes in a compact form factor and the rangefinder is very durable as well. As far as range goes, it’s around that seven hundred yards mark and there are plenty of extras that you get with the product. 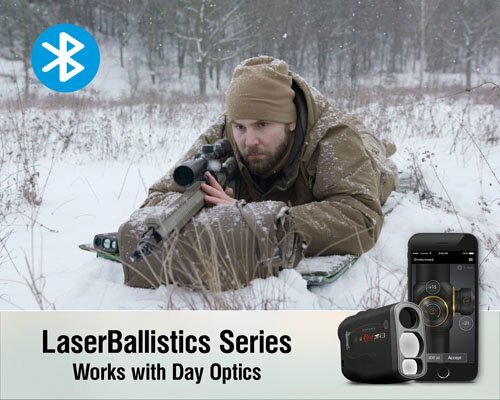 Powerful optics with 6x magnification and high-quality coatings combine for a crisp and bright display. Compact design, the rangefinder is sturdy and water-resistant while remaining lightweight and portable. The one thing that holds this rangefinder back is the build quality which, in no means, is horrible. It’s just comparatively a bit underwhelming. 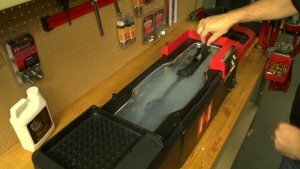 You do get a one year warranty so, you really don’t need to worry about it that much. There are a lot of good things here such as a lightweight build as well as water resistance. 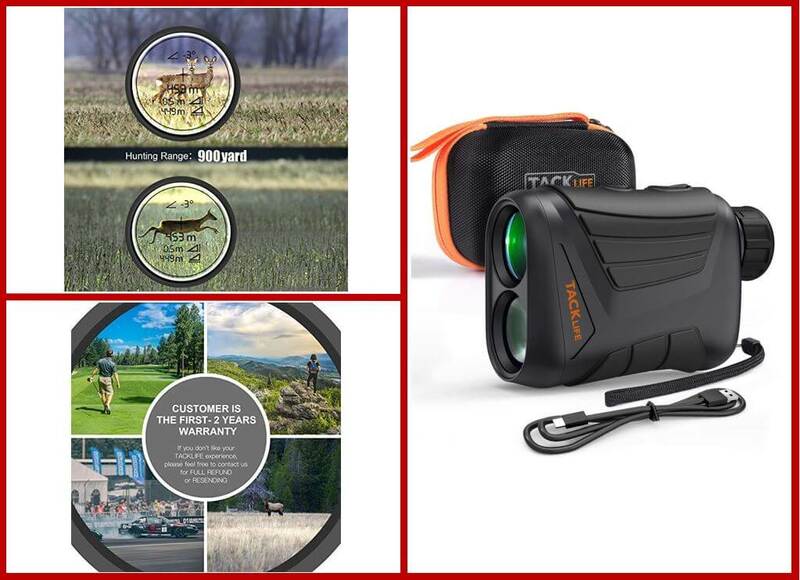 All these features made us to list this product in our list of best hunting rangefinder for the money. The Bushnell 202208 is a 4x Laser Rangefinder that has an accuracy of within a yard and a rather easy operation. The rangefinder is perfect for a beginner. 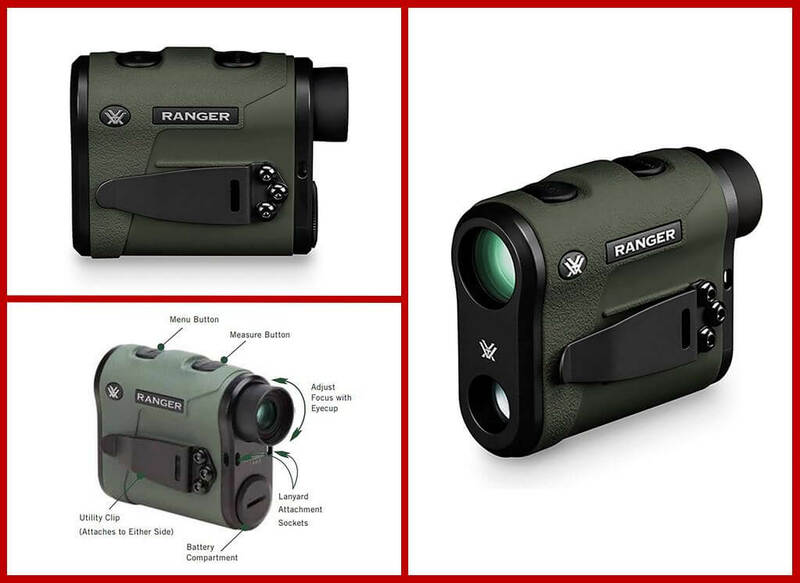 The rangefinder features an LCD display and a 600-yard range. The 4x zoom provided here is clear and design wise, the rangefinder delivers. The 4x zoom isn’t something to boast about, the 21mm objective lens doesn’t help either. The display is also LCD which, in comparison to an OLED display, looks dull. Other than that, the device is good enough in other aspects. One huge advantage is the price, it is easily one of the most well-priced rangefinders out there and is almost perfect for a new hunter. 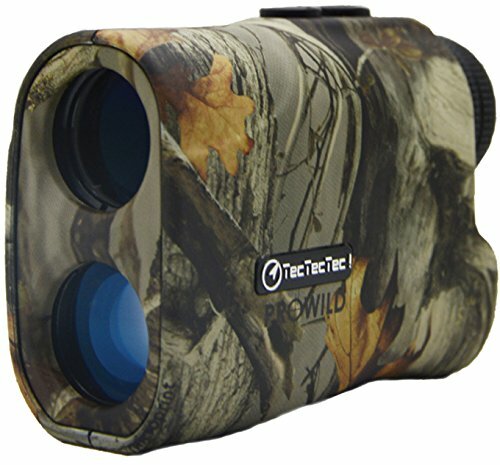 The TecTecTec Pro wild is a camo designed rangefinder which is best for hunting. As far as rifle hunting goes, the ProWind has a laser embedded with a range of about five hundred yards give or take. The premium optics has an impressive display and a free battery is also included here. The rangefinder is also pretty lightweight. 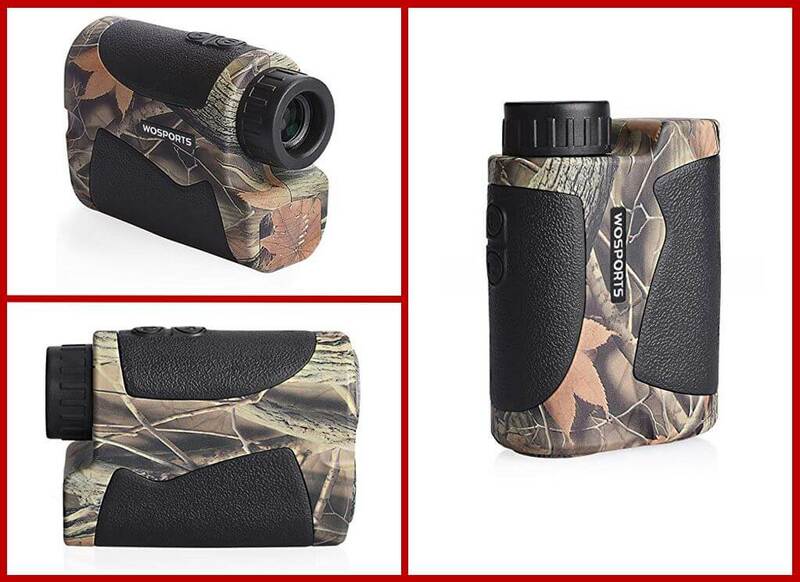 With the special camo design, it is definitely one of the best rangefinder for long range shooting. A lightweight and a portable rangefinder with a dimension of 104 x 72 x 41 mm and just a 185g weight. The lightweight design results in a questionable build. Pulling back from the build quality, other aspects such as affordability and resistance of the device is a huge advantage. There are also many extras that you get on your purchase. Another equally important thing is the price, the rangefinder is an affordable one. It can be used by both the new and the old hunters who are looking for an affordable rangefinder. 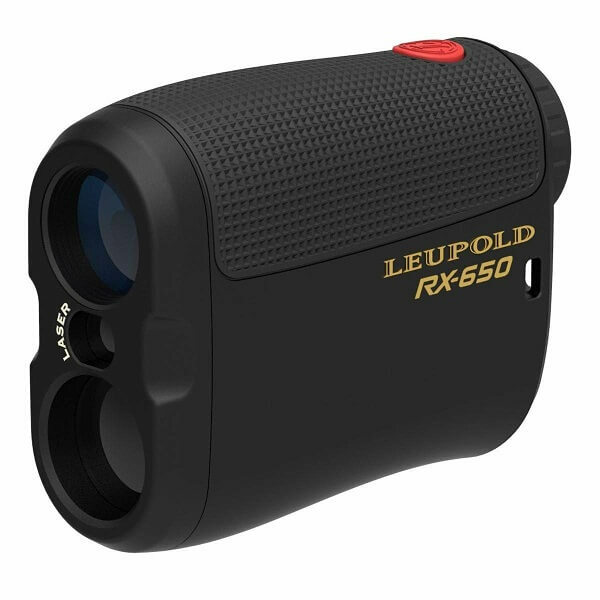 The Leupold RX-650 Rangefinder is a laser rangefinder with 6x magnification. The rangefinder has a fast focus eyepiece with a quick adjustment, the lens makes up for a bright image. The rangefinder is also water and fog proof and it runs on a CR2 lithium camera battery that provides a significant battery backup. This is also one of the best laser rangefinders too. The Leupold RX-650 is a rangefinder that kind of lacks in foggy situations. If the weather is clean and clear, then you can expect a considerable performance from it. On the upside, there is great build quality, despite the product being Chinese and it also has fast focus eyepiece. The adjustments are rather easy to make and the image, under good lighting condition, is crisp and bright. The word “smart” is present in the ATN Ballistics 1500 because it comes with a smartphone app and does all the calculations in the background. The rangefinder can be connected to your phone via Bluetooth. The range of this rangefinder is an impressive 1500 meters and despite having a long range, the rangefinder is always accurate. Real-time point of impact adjustments is also available. 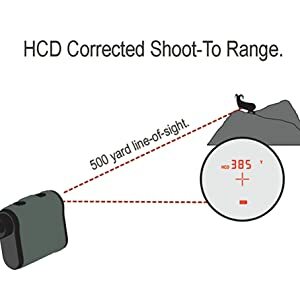 Considering all the facts, this is one of the best rangefinder for long range shooting. The ATN ballistics 1000 is a really expensive rangefinder. In addition, it doesn’t have a warranty which is it’s the biggest drawback. When you spend this much money, you need a warranty just to be sure. But I guess we can overlook it because the build quality is pretty good here. As far as performance goes, this rangefinder just kills it. 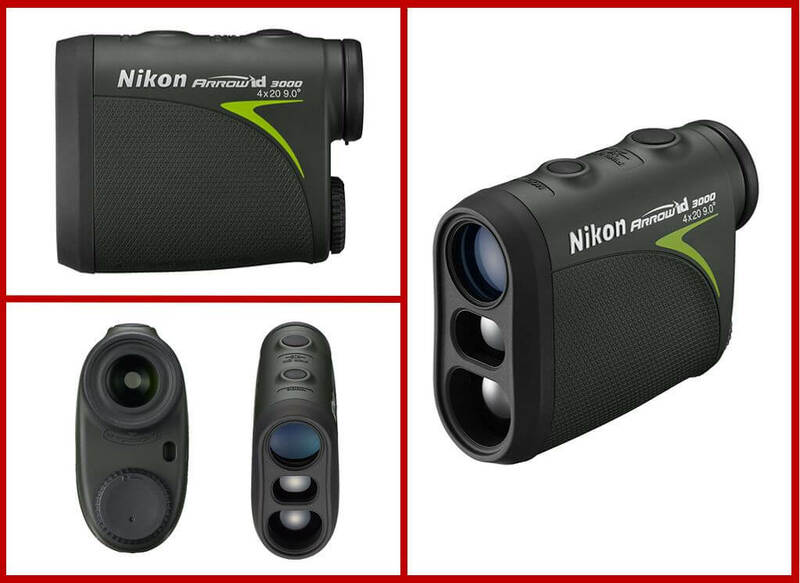 A long-range rangefinder with accuracy and features such as an impressive smartphone app, it can’t get better than this. An absolute recommendation for any shooting enthusiast. The Nikon 8377 rifle rangefinder has an automatic adjustment of light condition. Nikon has put a really capable rangefinder with a Tru-Target mode providing you with two settings. The rangefinder also has active brightness control and a faster measurement. The rangefinder also has an advanced ID technology and a larger optics for a wide field of view that can be very helpful for rifle hunters. A limited customizability option really is a minor drawback of the rangefinder whereas the build quality is what truly affects the otherwise impressive performance in other aspects. On the contrast, there are plenty of really good things about this device. First of all, it comes with a true target mode. The Advanced ID technology determines shooting angles and a wider field of view provides a better picture of the target. The display is also not bad here. The rangefinder does most of its jobs but yes, it does have it’s a fair share of disadvantages such as the customizability, it only provides two options here. Looking at the awesome performance from Nikon and this rangefinder’s features, it is clearly one of the best shooting rangefinders. The Leupold RX-1300i is a really inexpensive rangefinder with a magnification of 6x and the DNA feature which adds accuracy. The armor coated camo look of the rangefinder is also pretty impressive. The design is ergonomic so the rangefinder is sim and sleek, it can fit in your hand with no problem. This design along with a Quick Set menu allows for one-handed control which can be really useful for hunters. The rangefinder also has a scan mode to track movements and scan the area. The design and the build of the RX-1300i is something to talk about. The ergonomic design has a solid build that will last you for some time. Other features such as one hand usage and accuracy via the DNA technology is also great. Another huge feature is the scan mode which can be handy. The Ranger by Vortex Optics is a laser rangefinder that comes with plenty of features that are really cool. 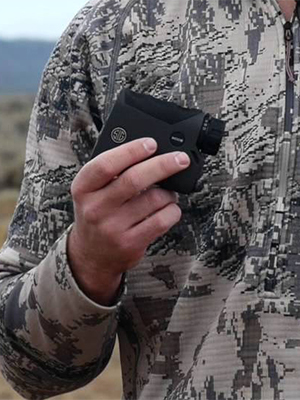 From multicoated lenses to illuminated displays and a menu that’s easy to get into, the range by vortex optics is one of the best rangefinders that we’ve encountered. It is mainly meant for bow hunting. So, if you’re an archer who is looking for the best rangefinder for bow hunting, this one is for you. There is a scan feature to provide continuous range readings when you pan across a landscape or track a moving target. The included 3 brightness settings allow the display to stay visible in different light conditions. The price can really cause people to roll their eyes. Yes, it’s that expensive. We have said that the price is a drawback but it’s just for the sake. The rangefinder really makes up for that expense as you might have deduced from looking at the long list of features. Solid build, great optics, ease of use, plenty of customization, the rangefinder is perfect for any type of bow hunter. Thoroughly recommended product if you have the money. The name itself suggests that it is for a hunter, what kind of hunter you ask? Obviously bow hunters! 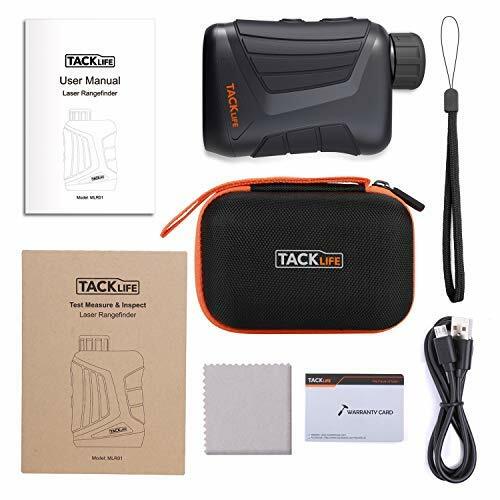 The company called TACKLIFE is behind this clever naming scheme and the rangefinder itself has specs which can wow many hunters. For instance, it comes with 7x magnification and the image is clear and durable. 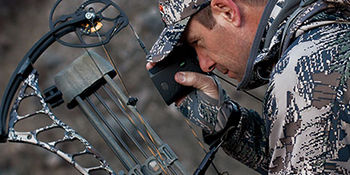 The body is water resistant therefore, the bow hunting rangefinder will last you long. A quarter inch tripod screw hole is there with the device meaning you can adjust it to any tripod with ease. The LCD display here is blunt, you can’t really expect much at this price point though. Aside from the display, other things are actually very nice. The rangefinder is ultra-affordable and it also has a lot of extra items included. Heck, you’re getting a 2-year warranty at this price point. A definite recommendation from us. It is perfect for an aspiring bow hunter. Every Nikon product is met with much speculation as to what it will bring to the table. The Nikon 16224 is no exception. This rangefinder has an advanced technology to measure all kinds of distances. The eye relief makes the viewing and ranging the target fast. It has a common LCD display to match all the features as well. 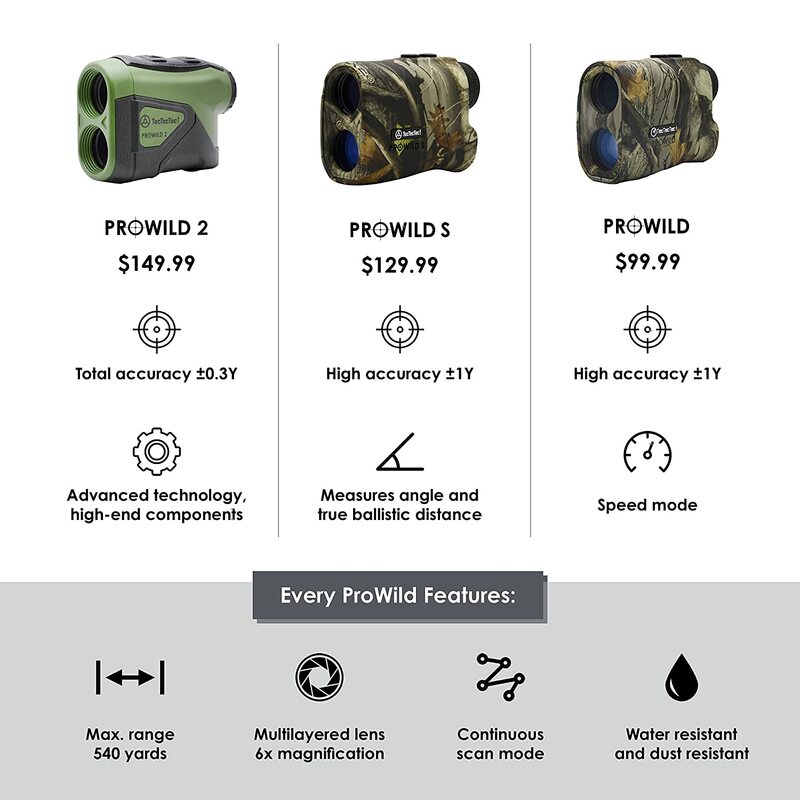 This excellent product is easily one of the best long range bow hunting rangefinders. As far as the performance is concerned, there is not much to talk about here. The device is okay for what it is and it comes at a really affordable price so, it can be great for anyone wanting to own a rangefinder. The 2-year limited warranty is the main advantage, other features are just okay and the huge letdown is from the LCD display which is difficult to read in low light conditions. This one drawback really makes it difficult to recommend this product. The price, for a Nikon product, is very affordable though. The Wosports Hunting Rangefinder works like a charm. The rangefinder is equipped with multiple functions and modes. The highlight here is that it can be used while golfing, in addition to bow hunting. The range is also pretty good and the rangefinder is very inexpensive making for an impressive product here. This rangefinder is an actual disappointment. Well, it is certainly ideal for people who just want to get an entry-level rangefinder at an affordable price but for serious hunters, this is a no-no. If it’s raining or cloudy, the rangefinder is set to be prone to error and the build quality isn’t something we’re particularly fond of. A total letdown despite having a 1-year guarantee. 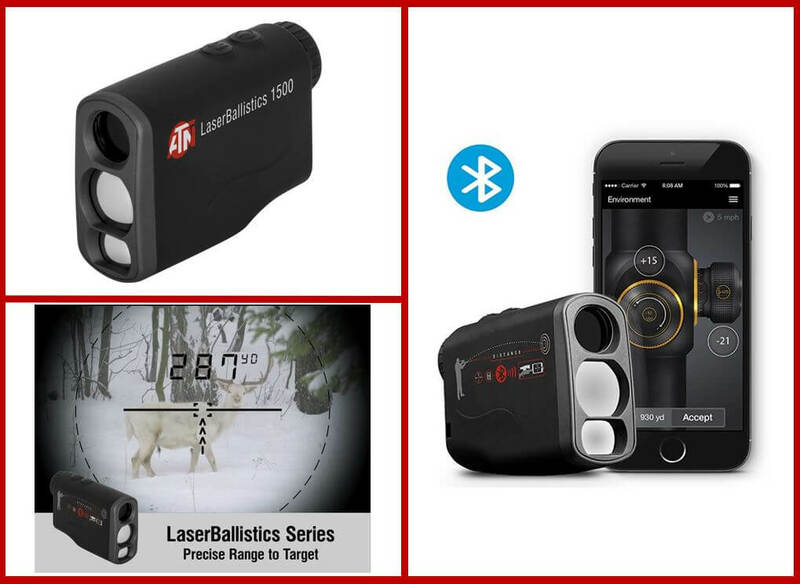 This laser rangefinder by Wosports improves upon its previous rangefinders. The improvement isn’t too significant but it is there nonetheless. The highlight here is the design. As we said, the change isn’t significant because the reading still lacks clarity. The same problems are repeated here but in a different way. The distance reading can be changed from yards to meter if you prefer it. The improvements from the classical Wosports Rangefinder? Design, Warranty and Build Quality. What remains the same? Inconsistent performance. The device really lacks in this area. It fails to give you a constant reading of the distance. Should you get it? Well No, to be blatantly honest. We don’t recommend this product. You can surely buy it if you’re a new hunter but don’t expect a pro level performance from it. 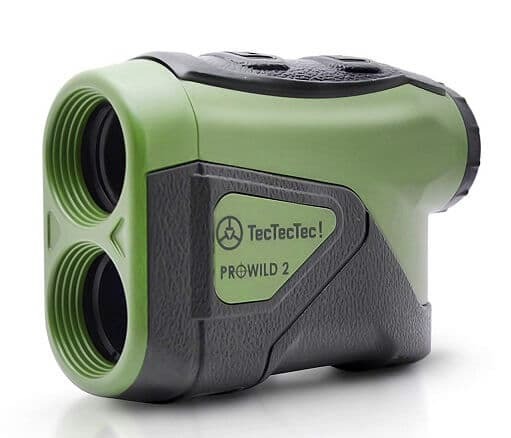 The TecTecTec ProWild2 is a premium laser rangefinder for hunting that can sight up to 540 yards and has a precise accuracy. The lens is premium and it sports a scan mode. The device itself is very lightweight and portable. The shock-resistant case also adds much value to the device. The design should’ve been camo. Even if it weren’t camo, it should’ve at least had a good color mix. The light greenish accent on a black body looks ugly. The green, if it was saturated, the rangefinder would’ve stood out. But this might not be an issue for many. It’s only personal preference, I guess. The actual working of the rangefinder isn’t flawed. The 2-year-old warranty is the icing on the cake and the price is another thing that is really just perfect. We might have saved the best for last here. Thoroughly Recommended! People usually use a scope as the main aiming addition while using a rifle. A scope isn’t bad too. It can definitely be useful as different settings can be used for various environment. However, a rangefinder is equally important as well. A rangefinder will tackle most distance-related problems that a hunter encounters. You don’t need to guess your shots and get a clean hit everytime you shoot. Even if you misjudge the wind, speed, and distance, a rifle rangefinder will still better your aim. There are some rangefinders that will calculate your bullet drop and compensate for the wind’s effect on your shot. Shenzhen Rui Er Xing Electronic Co., Ltd - Misc. Rangefinders for bow hunting work on the same principle as the rifle rangefinders. 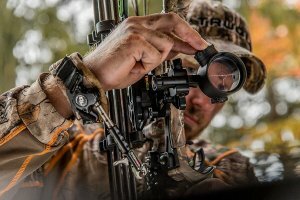 Some bow hunting rangefinders have additional features such as intelligent target priority recognition. There are also countless other features that will help archers overcome the distance estimation problems. 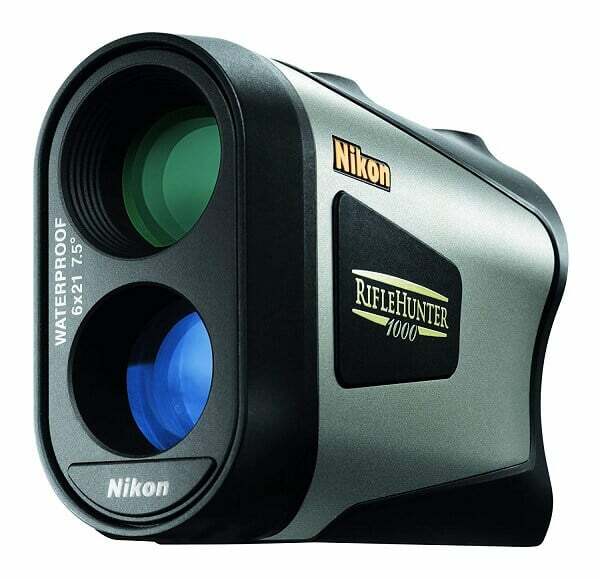 All-purpose rangefinders are meant for both kinds of hunting, as well as some other activities like golf, for instance. 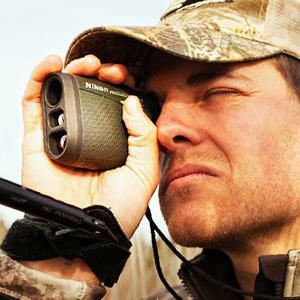 A binocular is also a rangefinder that can be useful for both bow and rifle hunters. This type of rangefinders have features such as Brush Mode or zip mode. 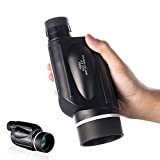 A binocular rangefinder is a bit expensive, hence, most people avoid it but if you want quality then, we recommend you get a binocular rangefinder. It doesn’t matter if you want a simple rangefinder or a complex, expensive one, a rangefinder will be really helpful to you. In this article, we’re only going to cover the monocular rangefinders. 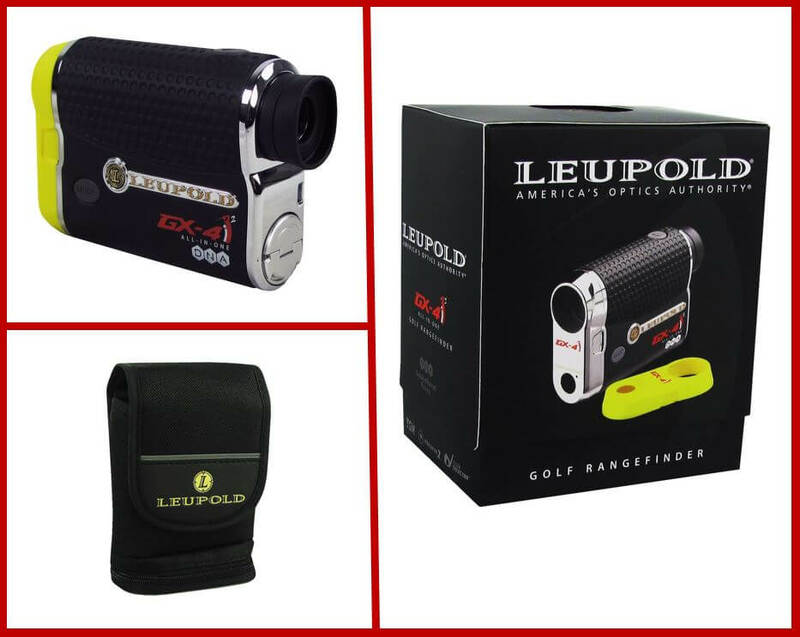 A rangefinder can either be used for hunting or you can use it for things like the golfing. Before getting a rangefinder, do examine your needs and proceed accordingly. Not all rangefinders will give you a range of a target 1 km away. There are only few who do this and they’re on the high end of the spectrum. Don’t get an 800-yard measurement rangefinder and regret it later. Determine your needs prior to the purchase. 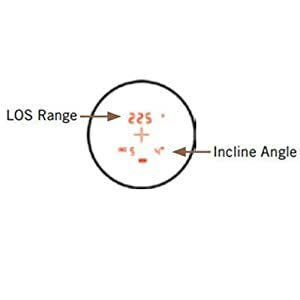 The crosshair of the rangefinder is a reticle i.e, they are the aiming point or the circle. The reticles are made of black lines generally and some are illuminated. An LED light is also present. While choosing the reticle, get a reticle with lights bright enough for low light but not too bright for a sunny day. Ultra-bright reticles can also cause glaring and unwanted obstruction to your views. More power means more battery life i.e, more the rangefinder will last and more magnification means you can zoom in and still get a clear picture. The final thing is the build quality, the warranty or the guarantee involved, see if the rangefinder fits your budget and the extra items that you’re getting with it. To conclude, rangefinders are important if you’re a hunter who hunts with either a bow or a rifle. There are many options to choose from and we hope that this detailed article will help you to find the best hunting rangefinder for the money that also suits your need. Make sure you get your requirements straight at first and then make an informed decision on how you should proceed. Q. Can a hunting range finder be used for golfing? Ans. 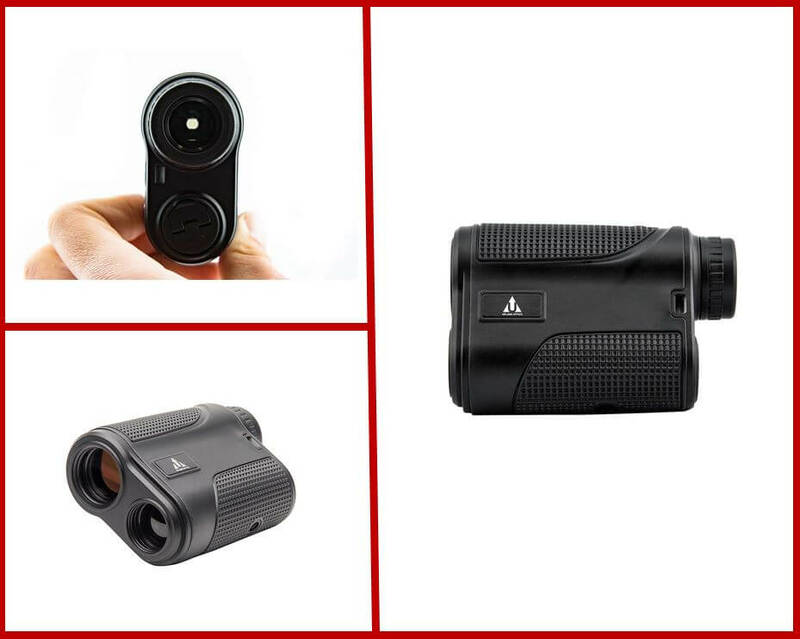 Al purpose rangefinders can be used for golfing. 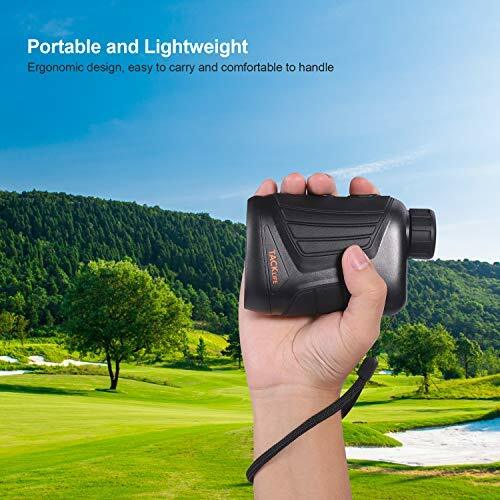 Only a few specific hunting rangefinders are there which supports golfing as well. Q. 100$ rangefinder or 500$ rangefinder? Ans. The choice is yours. Why not 250$ rangefinder, right? See, you get what you pay for so, stick to your budget. Obviously, a 500$ rangefinder will beat a 100$ rangefinder but it doesn’t mean that you really need that same rangefinder, other inexpensive products will definitely do the trick. Ans. Not at all, features and quality matters. Q. Where should I buy a rangefinder? Ans. Retail stores can have a price hike whereas buying them online will result in delivery charges most of the time. Weigh in both options and see which one is less expensive for you. We are glad that you liked this detailed article. Have a look at our other articles too.